ProtectEar has produced a series of three articles regarding the challenges to knowing how much protection is given to an associate in a hearing loss prevention program. This the 2nd article in the series, deals with the quantification and reporting of attenuation. The initial article dealt with the history of trying to measure and report attenuation. The final article deals with “After Hearing Loss Prevention, then what?” What are the next steps a firm can apply to go beyond the current practice in hearing loss prevention? The U.S. Environmental Protection Agency (EPA) was charged by the Noise Control Act of 1972 with developing and enforcing regulations pertaining to Product Noise Labeling. As a result the EPA developed 40 CFR 211 Subpart B – Hearing Protective Devices, in which the Noise Reduction Rating (NRR) was defined. The NRR is a single-number rating which has been required by law to be shown on the label of each hearing protective device (HPD) sold in the United States since 1979. Before any HPD may be sold in the United States, the manufacturer or distributor must have it tested according to the requirements of the law, submit the data to the EPA, and provide the NRR along with corollary information on the HPD’s packaging. The NRR was intended to allow the consumer to select an HPD appropriate for the noises in which it would be used to prevent noise-induced hearing loss (NIHL). The law requires that the values of sound attenuation used for calculation of the NRR be determined in accordance with ANSI S3.19-1974. It matters not whether the HPD is intended for protection from occupational or recreational noise, or even to reduce the impact of traffic noise or the snoring of a partner on sleep, it must be labeled with the NRR label and corollary information. Real-ear attenuation at threshold (REAT) is determined by carefully measuring the hearing thresholds of ten (10) normal-hearing members of a subject panel. Their hearing thresholds are measured for narrow bands of noise in a highly specified acoustic environment. Each subject is tested twice; ears open and ears occluded with the HPD being tested. The experimenter-fit method defined in ANSI S3.19 is used. Rather than allowing the subject to put on or remove the HPD, the experimenter fits the hearing protector to the ear of each test subject for each occluded test for what they consider is a best fit. REAT is the difference between the thresholds with the ears occluded and the ears open. Each subject repeats the paired open/occluded test three (3) times. Mean attenuations and standard deviations are calculated in accordance with the standard. The NRR calculation is specified by the EPA’s law, not the ANSI S3.19 standard. The NRR is computed from the mean attenuations and standard deviations of the attenuations for each of the nine (9) narrow bands of noise. The NRR is intended to predict the minimum amount of protection provided to 98% of potential users. How has the NRR been used? where the protected dBA and the unprotected dBC are 8-hour time-weighted average1s (TWA1s) determined according to the Occupational Noise Standard. This method is how the NRR was designed to be used. For example, if a protector has an NRR of 17 dB and it is used for an TWA[i] of 95 dBC, the noise level entering the ear could be expected to be 78 dBA [95 – 17 = 78] or lower in 98% of the cases if the protector is worn according to manufacturer’s specification as fitted by the experimenter during the testing. Where, again, the protected and unprotected dBA are 8-hour time-weighted averages determined according to the Occupational Noise Standard (1093). This method is an adaptation for those whose instrumentation does not have C-weighting capabilities. The 7-dB correction factor is used to account for the de-emphasis of low-frequency energy inherent to the A-weighting scale. So, for example, if a protector has an NRR of 17 dB and it is used for an environmental noise exposure level of 95 dBA, the noise level entering the ear could be expected to be 85 dBA [95 – (17 – 7) = 85] or less in 98% of the cases. A study by Berger, Franks, and LIndgren, (1996) evaluated data from 22 studies of real-world REATs. They found that labeled NRRs for the HPDs studied over-estimated the reported REATs by as little as 5% and by as much as 2000%. NIOSH reevaluated the data and consequently recommended derating the NRR by a multiplicative factor of 75% for earmuffs, 50% for slow-recovery formable earplugs, and 30% for all other earplugs (NIOSH, 1998). The NIOSH derating scheme did not affect the 7-decibel dBC-to-dBA correction as it was applied to the NRR only. Derating was not applied to custom-molded earplugs, however, so they may range from extremely effective (meeting labeled NRR) to completely ineffective (providing no protection at all). It all depends upon the quality of the impression and the quality assurance of the laboratory making the earplug. OSHA’s approach to using the NRR, while recognizing the NIOSH derating scheme, is to derate the NRR by 50% regardless of hearing protector type when considering whether an HPD will provide adequate hearing protection for a given noise exposure level expressed as a TWA. Thus, if the noise exposure level were made in dBA, most often the case, the protected exposure level for a 95-dBA exposure and an HPD with an NRR of 29 dB would be 84 dBA – [95 – ((29-7)/2)], 1 dB less than the OSHA Action Level (OSHA, 2016). So, what do I do with the NRR? Use the NRR as the laboratory-based noise reduction for a given hearing protector. Apply a safety factor of 50 percent; i.e., divide the calculated laboratory-based attenuation by 2. NOTE: This is a general method for taking into consideration OSHA experience and the published scientific literature, which indicate that laboratory-obtained attenuation data for hearing protectors are seldom achieved in the workplace. If a different or no safety factor seems appropriate in a particular instance, it may be used instead. For example, for laboratory-made custom-molded earplugs, NIOSH recommended that no safety factor (derating) be applied. The adjusted noise reduction should be sufficient to meet requirement that the protected noise exposure level be less than the OSHA Action Level of TWA < 85 dBA. So, if you are using custom molded earplugs, you can take the NRR on the label at face value and apply it as suggested above without applying a safety factor or derating it. For the custom molded earplug, it seems to not matter whether the experimenter or the subject fits it for testing. The outcome is about the same[ii]. A New Rating: A new “subject fit” or naïve subject method of measuring HPD attenuation can be used to calculate a different rating; the NRR(SF). The people (subjects) in this laboratory test fit their own protector according to the manufacturer’s instructions without the help of the person conducting the test. While the subjects are very well trained in taking hearing tests, they do not use HPDs regularly, have not participated in an experimenter-fit procedure, and have only used a few HPDs without formal training (hence naïve subject). Compared to the NRR shown on the current EPA label, the NRR(SF) is usually a lower rating that may be closer to the performance of the hearing protector in the real world. The NRR (SF) was developed by the National Hearing Conservation Association’s (NHCA) Task Force on Hearing Protector Effectiveness to address labeling related issues (Royster, 1995). How do I use the NRR (SF)? Protected dBA = unprotected dBA – NRR(SF). If the C-weighted noise exposure level is used, a 3-dB adjustment is made to account for predicted differences in the A and C levels (recent re-evaluations of the noise databases that were used to developed the NRR (SF) found the A- versus C weighted difference to be 3 dB, not 5 dB and not 7 dB). Protected dBA = unprotected dBC -3 dB – NRR(SF). Where can I find the NRR(SF)? The adoption of the initial version of ANSI S12.6 in 1997 as the standard that replaced ANSI S3.19-1974 did not change the regulatory requirements that all protectors sold in the United States be labeled with the NRR as described above and obtained by testing according to the experimenter-fit method of ANSI S3.19-1974. 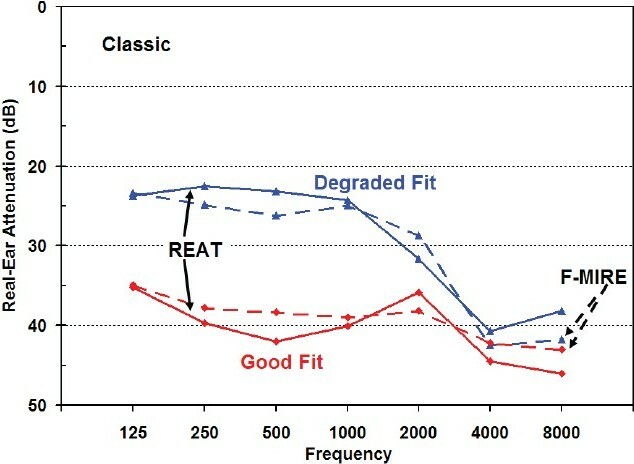 After ANSI 12.6 was adopted and ANSI S3.19 was rescinded, many hearing protector manufacturers began testing their products in accordance with Method B, the subject-fit method. However, only a few manufacturers have released the data. As other jurisdictions outside of North America have started to demand data from testing procedures similar to Method B of ANSI S12.6, many companies have complied. The NRR(SF) is used in Brazil, Australia, and New Zealand. Every HPD sold in Brazil is tested by an approved Brazilian laboratory by Method B of ANSI S12.6-1997 before the HPD may be sold in Brazil. Australia and New Zealand require every HPD sold in those countries to have been tested by Method B and then labeled accordingly with the NRR(SF), but the testing may be done by a laboratory anywhere. A search of the Internet or direct inquiry with the company may result in access to Method B data and a value similar to the NRR(SF). The NIOSH online Hearing Protector Device Compendium lists most of the HPDs sold in the United States and shows the NRR(SF) for many of them. The Compendium also lists the Internet website for almost all the manufacturers, which may provide more information. Can I legally use the NRR(SF)? Yes. OSHA has recognized the NRR(SF) as an alternative the NRR as another way to apply a safety factor to the NRR. If you are considering two devices, one of which has both an NRR and NRR(SF), select the device with the NRR(SF) and apply it to the equations above to determine if it can provide adequate protection. The best value for protected level is between 70 and 80 dBA. A protected level of less than 70 dBA indicates potential over protection. A person who is overprotected may be isolated from the larger acoustic environment, unable to hear warning signals and fellow workers. As such, the overprotected worker can be a safety hazard. 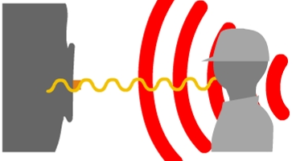 There are reports of workers being injured and killed because they were unable to hear warning signals or the sound of approaching vehicles because they were wearing HPDs that provided too much attenuation. The primary complaint that workers have reported about used HPDs are that they can’t hear fellow employees talking to them and that they can’t hear their equipment. It isn’t unusual to see a worker lift an earmuff cup or remove an earplug to talk with a fellow worker, and then replace it, a type of action that undoes the effectiveness of the HPD. Carefully selecting HPDs to avoid overprotection could also ameliorate the hazard potentials and worker attempts to work around using HPDs. If the protected value is above 80 dBA, the worker will be under protected. Under protection can result in the development of NIHL despite using the HPD. NIHL is insidious. It starts gradually and will generally go unnoticed until the hearing loss begins to interfere with communication. NIOSH’s definition of material hearing impairment (Franks, et al., 1998) is such that a person can suffer a change in hearing up to the point of developing a material impairment without noticing any change in day-to-day auditory function. Beyond that point, the hearing loss becomes an impairment. NIHL will usually cross the line from loss to impairment within the first five years of exposure. It is often observed that under protected workers develop NIIHL. Any hearing loss prevention program that relies upon the NRR(SF) instead of the NRR and insures that workers are neither under or over protected will be successful in preventing NIHL and will have no problems with OSHA nor another other regulatory agency. American National Standards Institute. (1974) American National Standard for the Measurement of Real-Ear Hearing Protectors and Physical Attenuation of Earmuffs. ANSI S3.19-1974, American National Standards Institute, New York, NY. American National Standards Institute. (1997) Methods for Measuring the real-ear attenuation of hearing protectors. ANSI S12.6-1997 American National Standards Institute, New York, NY. Environmental Protection Agency. (1979). 4 0 CFR Part 211 – Product noise labeling, Subpart B – Hearing protective devices. 44 Federal Register 56139-56147. Johnson DL and Nixon CW (1974) Simplified methods for estimating hearing protector performance. Sound and Vib 8(6):20-27. Kroes P, Fleming R; Lempert B. (1975). List of personal hearing protectors and attenuation data, NIOSH Technical Report, HEW Publication No. (NIOSH) 76-120. National Institute for Occupational Safety and Health (2016) Hearing Protective Device Compendium. https://www.cdc.gov/niosh/topics/noise/hpdcomp/. Royster LH. (1995). In search of a meaningful measure of hearing protector effectiveness; Recommendations of the NHCA’s task force on hearing protector effectiveness. Spectrum 12(2):1, 6-13. U.S. Department of Labor, Occupational Safety and Health Administration. (1983). Occupational Noise Exposure: Hearing Conservation Amendment; Final Rule. 48(46) Federal Register 9738-9785. U.S. Department of Labor, Occupational Safety and Health Administration. (1983). 29 CFR 1910.95(b)(1), Guidelines for Noise Enforcement; Appendix A. [i] Time Weighted Average –The permissible exposure limit (PEL or OSHA PEL) is a legal limit in the United States for exposure of an employee to a chemical substance or physical agent such as loud noise. A PEL is usually given as a time-weighted average (TWA), A TWA is the average exposure over a specified period, usually a nominal eight hours. For noise, the PEL is a TWA8 of 90 dBA with an excursion limit of 115 dBA. The TWA involves a trading ratio of time and intensity, which for noise is 5 dB so that the allowable exposure time doubles or halves as the sound level decreases or increases by 5 dB. If you’ve missed any articles in the series let us know. Submit your email address and we’ll send you a link to download other articles.